I can't really add much to what Al Jaramillo, the bird's finder yesterday, said about this apparent 3rd-cycle individual. 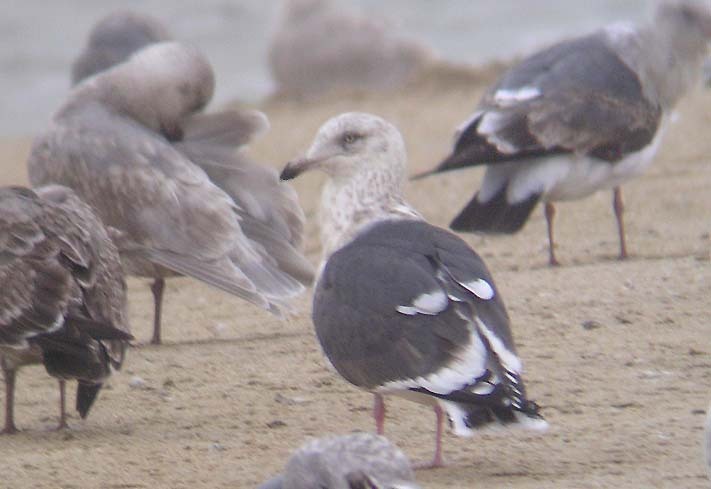 Although there were dozens of observers, it was not spotted until a flight of "new" gulls, possibly from inland (dumps? ), appeared at about 4 p.m. and the huge flock began 'rolling' north up the beach. This bird was spotted by Brian Fitch, I believe, went to drink, and then preened excessively until 5 p.m. when I left. 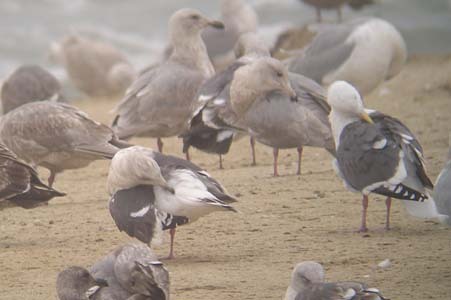 Of note in the two photo, right, is that the presumed Slaty-backed (left-hand dark-backed bird) was quite similar in upperpart coloration to a presumed wymani or "southend occidentalis" Western Gull. 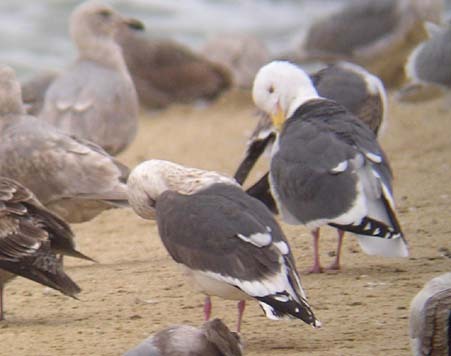 [Without getting into details, the cline of Western Gulls down the coast is a series of steps, not a gradual gradient, in increasing back color, with, for example, MTY breeders being darker-backed than Farallon breeders]. There was a slightly more blue tone to Western, more flat slaty-gray to the Slaty-backed. Best features at a distance were the bright yellow eye, the heavily streaked nape (in a pattern of dark brown droplets rather unlike U.S. species), and slightly more prominent tertial-secondary white crescent on the standing bird. I felt that the legs were shorter; this can be compared in these shots and is a measurable difference. 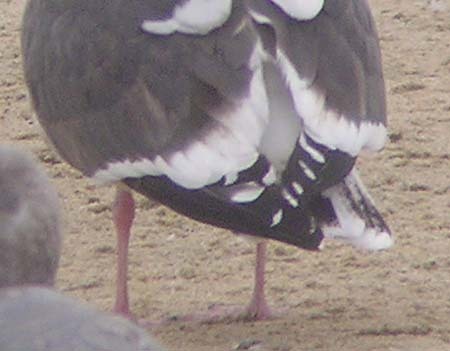 Maybe slightly pinker legs, also. Here is a close-up of primary details, including the 'spur' on what seems likely to be p7 on right side that Al Jaramillo spoke about, and that is part of the 'string of pearls' in flight. We did have brief flight views but I did not get snaps of any spread wing. 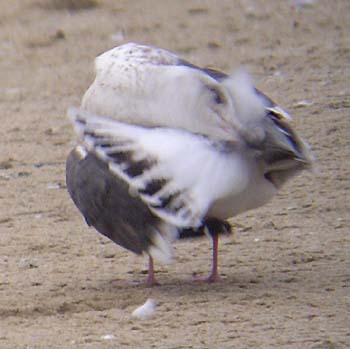 As the bird preened its rump, these details of the spread upper tail were visible. 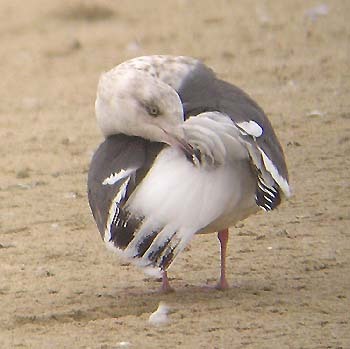 Again, note also the yellow eye, the 'mascara' around and behind the eye, the bill pattern, and the rather short legs on a comparatively smallish, pot-bellied large gull. Additional photos of this bird are on line: 20 Jan by Al Jaramillo and 21 Jan by Joe Morlan. Both of these pages also have detailed discussions of identification. A fine shot of the spread upperwing, showing the classic 'string-of-pearls' pattern was taken 22 Jan by Martin Meyers. See the family page for county abbreviations. All photos & text © 2005 Don Roberson; all rights reserved. Readers may use this material for their own private enjoyment, study, or research but none of the photos or text herein may be used commercially nor may they be reposted on other web sites without written permission. All material is copyrighted.